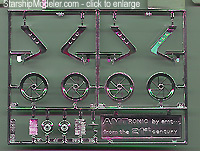 Kit preview of AMT's Amtronic Reissue . The future was ever so much "cooler" in 1969. ^ The original boxart was more inspiring. Click on any of the following for a larger image. ^ Parts, as they say, is parts. ^ Tell me this doesn't have kitbash written all over it! ^ This is what they thought a computerized dash would look like in 1969. ^ The chrome plating is actually decent - not flaky, as in several recent offerings. Progress, at the time, was dizzying. Back then, folks envisioned a near future filled with orbital space stations, passenger service to the moon, and hyper-intelligent, self-aware computers. We'd gad about town in spiffy little turbine-powered hoverpods, then casually hook up a larger passenger module for the high speed trip across the continent for dinner with the in-laws. AMT originally issued this kit in 1969. 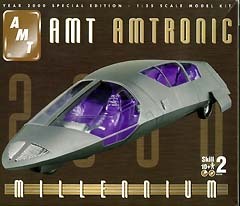 It was based on one of Detroit's visions for a future high-speed family car as modified by AMT (no doubt to make it easier to tool). The concept envisioned a small front module that could be used like a normal car for running errands and such. For longer trips, a rear passenger module would be hooked up, and the combined vehicle driven to a special high-speed "express-chute" system, where "lateral control arms" would contact special guide rails, ducted fans would power up, and passengers would be whisked across the countryside at speeds over 300mph. 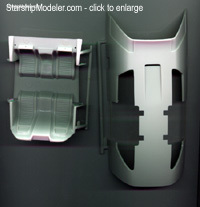 (For more details, see the brochures included with the original kit here). As it turns out, the future didn't quite happen that way. We're still driving automobiles not terribly different in form and function than those of 1969 - though there's more computing power in the engine control module of my Dodge pickup than in the vehicles that took men to the moon and back. Go figure. This kit has never been reissued, and the molds have held up surprisingly well over the years. I was pleasantly surprised upon opening the box. It's jam-packed with plastic - so much so it's hard to get everything back in! The box says this is a Skill Level 2 kit, but with 150 parts, I'd say that's a bit optimistic. Go slow, however, and you'll save yourself a lot of frustration. 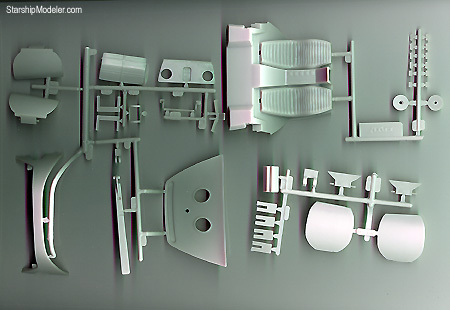 There are several sprue trees of grey plastic parts in two bags, another couple of bags containing chromed trees, and yet another bag containing a substantial number of clear parts. "Rubber" tires, a small bag of metal pins and a small sprue of red traffic signal lights round out the inventory. Flash is non-existant. Mold seams and sinkholes are few and far between. Ejector pin marks, however, are all over the place. Detail consists mostly of raised likes and is actually about on par with the company's recent offerings. The points where parts attach to sprue trees are substantially smaller than the monster gates ERTL has been using of late, which will make parts cleanup quite a bit easier than I'm used to with their kits. 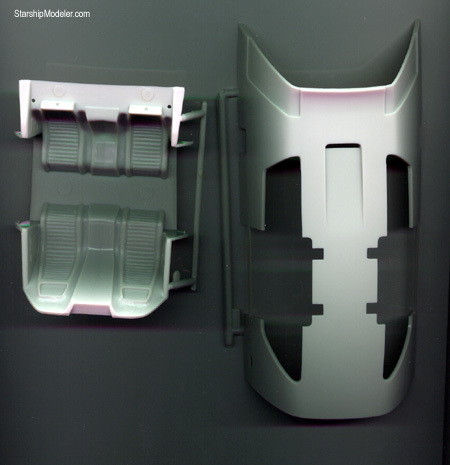 The chrome parts look very nice, especially considering the reports I've read of recent ERTL kits and their tendency to shed the plating like a dog with the mange. Of course, the first thing I'm going to do is soak them in bleach to dissolve the stuff; it's a bit heavy, obscuring some detail ... and I want to build this in a more heavily weathered state. The rubber (actually, some sort of PVC or ABS plastic) wheels are nicely detailed, though lacking manufacturer stamps - interesting, as the original brochure makes a quite a point about Goodyear's ideas for futuristic tires. I'll probably make a cast of one and replace all with resin copies. My experience with ERTL tires of this sort is that they eat plastic hubs over time - the ones on the F3F7 kit sure do! 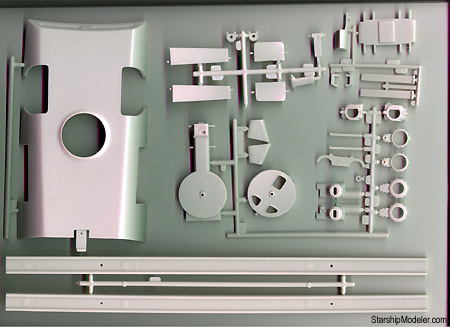 Instructions are typical for ERTL - big exploded diagrams in several assembly steps. They appear easy enough to follow, as usual. No paint guide or step-by-step paint call-outs are provided, so feel free to paint this any old way you choose. No decals are provided either, not even for license plates. What can I say? It's an ERTL kit. Fit will no doubt be OK, though you'll almost certainly need putty and extra patience. 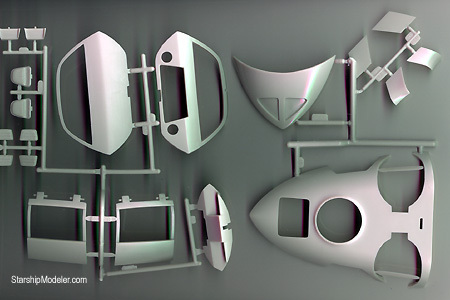 There are a number of operating features, such as opening hatches, that were typical of when the kit was first made. Parts fit in these areas is sure to be sloppy. Detail throughout is ... acceptable, but can definitely be improved upon with relatively simple scratchbuilding. I plan to drill out all the instrument dials, for instance, and back the piece with new displays printed on an acetate sheet. The large clear windows will allow most of the work you put into the interior to be visible, especially after a bath in Future. I'll also strip the chrome and paint with more realistic metallic colors. One thing to be aware of: this car was supposed to be made of aircraft-grade lightweight alloys and plastics, so you wouldn't see a lot of rust on these things. This doesn't mean you can't do some dramatic weathering - heck, just look at any current car after a winter in Chicago for what's possible! I like it. It's got an interesting shape, plenty of room for additional detailing and creative finishing - and loads of cool-looking parts. When these things go on close-out sale in the outlet stores, I'm going to buy a bunch just for kitbashing supplies. 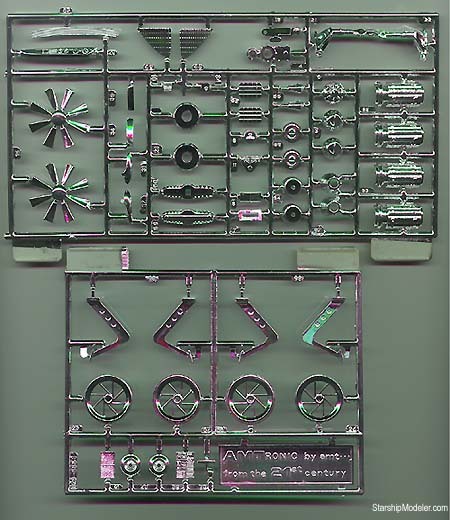 I'm sure any modeler with a couple of kits under their belt can have fun with this, though kids may have trouble with the large number of parts. Recommended. Many thanks to my wallet for providing the review sample and my wife for not saying anything about yet another kit in the closet. Manufacturers and retailers, interested in getting your wares reviewed and publicized on a site averaging 2000+ readers a day? Contact us! This page copyright © 2001 Starship Modeler. Last updated on 17 January 2001.